Downton Abbey: why PBS airs it so much later than ITV. 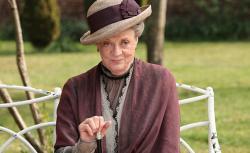 Why Downton Abbey Airs So Much Later in the U.S.
Maggie Smith as the Dowager Countess. © Carnival Film & TV Limited 2011 for MASTERPIECE. A year ago, we wondered here on Brow Beat why there was a lag between the U.K. & U.S. airings of Downton Abbey, when such a large gap does not always exist with other British shows. Season 3 of the series is about to arrive, and the disparity persists: On Thursday, TV critic Alan Sepinwall tweeted, “Nearly all the comments so far on my Downton Abbey review are people complaining about the lag between UK & US broadcasts.” Even Slate’s Downton Abbey TV Club warmed up by kvetching about the delay. So this year, we asked Beth Hoppe, PBS’s new programming chief, to explain the scheduling. Slate: Why do we Americans have to wait several months after the U.K. airing for shows like Downton Abbey and Sherlock? You turn us into addicts and then make us choose between pirating or running into spoilers on the Internet! Beth Hoppe: This is a question we’re looking at carefully, and it’s a really complicated issue. Where we have Downton now—and have had it for the last two seasons—in January, it’s done incredibly well. It has turned a lot of people into addicts, so we understand people’s feelings, but it gives us an opportunity to promote Downton properly, to not be head-to-head against the fall premiere schedules on the networks. And our version is slightly different, so there are editorial concerns—ITV is a commercial network, so we have to plug up the holes and make our version. We are looking at it for the future, but we don’t want to do anything that will hurt Downton. We have found an audience that still comes to it, even though it is several months later. We think this is the best season yet, and the buzz is amazing. We don’t know that we could build that buzz in the fall. If we see evidence that we’ve hurt the show beyond what we read in the press—if people are abandoning it for any reason—we’ll have to re-evaluate for future seasons. Slate: With Sherlock, did I read that there’s going to be an even longer delay from the U.K. airing for the next season? Hoppe: No, with Sherlock it’s a production delay, because of the schedules of Benedict Cumberbatch and Martin Freeman and Steven Moffat and Mark Gattis. Their major stars are making tons of money doing features, and Sherlock is a labor of love. They aren’t shooting for a few months yet. I feel that the audience for Sherlock is a little different from our Downton audience—they might be a little bit younger and a little more inclined to look for it elsewhere if they aren’t getting it when they want it, so I think we are going to take that into account when we make the decision with Sherlock. We aired the Call the Midwife Christmas special four days after it premiered in the U.K. That was a successful broadcast, though it might have been a little lost in that our Season 1 was back in the fall and our Season 2 is coming in March, so it was a one-off in the middle. But we turned it around just as quickly as we could, and we got a lot of thanks from our viewers for that. But I have to be honest, there was no noticeable ratings benefit from doing that, though there was some positive buzz around it. Slate: Let’s talk about that versioning thing. As you say, Downton Abbey has ads in the U.K., so you have to plug those holes, but there are other, minor cuts, right? Having seen the same episode of Sherlock, [a BBC show that doesn’t have ads, in the U.K. and on PBS, I know that some small cuts were made to trim a few minutes. Why do you do that? Hoppe: It comes down to different broadcast lengths. What we’ve tried to do with Downton is have the producers, Carnival Films, make the changes so that the creatives who are responsible for the British version are also responsible for our version, and we can stand totally behind the content and the storytelling. Slate: Why does that matter these days? Why do you need shows to run for a consistent length? Hoppe: Our stations depend on our breaks between programs for connecting with their local audience and doing promotion, so we have set lengths for PBS hours, which is actually the longest hour in television: 56 minutes and 46 seconds. And that’s all content.